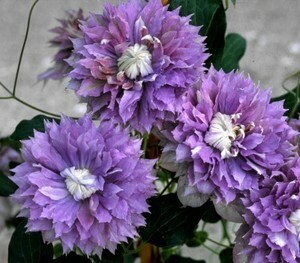 description for "Clematis: Clematis 'Evipo039' PP20,638"
Diamantina Clematis is an exceptional, free-flowering clematis with 4-6" pom-pom-like blue double flowers, each lasting up to 4 weeks. Repeat flowering throughout summer. Grows 6-8 feet tall in full sun. Zones 4-9. Edited by M.Tate. Introduced by Bailey Nurseries in 2012.
reviews for "Clematis: Clematis 'Evipo039' PP20,638"